This weekend, Stonemaier Games hosted its fourth annual Design Day. On Saturday, various hosts in St. Louis (myself and a few others) held day-long game days at our homes. 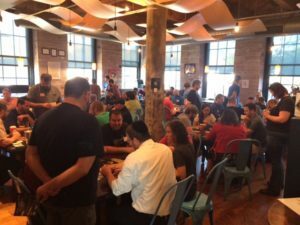 On Sunday, the Design Day itself featured 95 designers, playtesters, and gamers from St. Louis and around the country for 12 hours of playtesting and gaming. The purpose of Design Day is to bring together designers and playtesters to give and receive feedback on game prototypes, expand their network within the gaming community, and learn from clever mechanisms in published games. If you’d like to know details about how the day is structured, you can read about previous Design Days here, here, and here. Rather, Design Day is just something I like doing. I like doing it for the designers. I like doing it for the playtesters and gamers. And I like doing it for me–it feels good for me to host something fun and useful for others, and I get to play games for a day with awesome people. Design 2017 was structurally similar to 2016, but there were a few key changes based on some new opportunities and feedback we got last year. Location: Design Day was previously held in a church’s basement social hall. 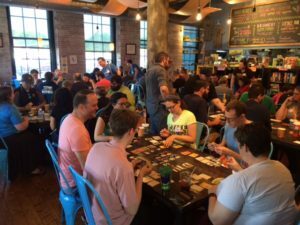 This year, St. Louis was lucky to get its first board game cafe, Pieces, and they offered to host Design Day at their location. Every aspect of their space is perfectly crafted for playing games–you can see how nice it is in the photos on this post. They coordinated of all the food, drinks, and service to create the perfect atmosphere for an event like this. On a personal note, it was really nice for me because even though I planned the event and was constantly trying to make sure people were as involved as they wanted to be, I was able to sit down and play/watch games for long periods of time. Schedule: The previous 3 years, Design Day was on a Saturday, and that was it. It’s a long, intense day, so neither I nor the attendees have energy to spare for more gaming on Sunday, even though many people drive or fly in from out of town to attend and wouldn’t mind having more than just 1 day. After we started talking to Pieces about hosting the event, I realized that Saturday wouldn’t be the best fit because that’s by far their top-earning day of the week–I didn’t want to take that away from them (we paid Pieces, of course, but not enough to count for a robust Saturday). That opened up the possibility of playing games more casually on Sunday at various locations, and a number of hosts volunteered. I had 20 people in my tiny condo, and there were at least 30-40 people playing games at other satellite events around the city. Houston: In past years I’ve invited people to bring a good game they no longer play to a game swap at Design Day. That way everyone walks away with a game they want (hopefully). I didn’t feel comfortable doing this at Pieces, though, as Pieces has a substantial collection that risked getting mixed into the swap. Also, it’s a bit of a logistical hassle that doesn’t really fit into the purpose of Design Day. However, a few weeks ago, a hurricane hit Houston, and a lot of people have suffered in various ways, including people who lost their game collections. One of the couples attending Design Day, Kama and Joe, offered to coordinate a game donation to flood victims in Houston via a games store there called Asgard Games. I donated over 25% of my collection, and a lot of other attendees contributed as well. Flexibility: Design Day is a very structured event, as people sign up for specific timeslots and tables. I’m actually pretty amazed by how well the schedule works without me ever needing to interrupt the event with an announcement or directive. But things don’t always go as planned–people get sick at the last minute, playtesters change their minds, etc. In the past, I’ve dashed around the room, trying to find a game for everyone and swapping playtests as necessary. I still kept my eye on that this year, but attendees also knew up front that there might be times that they’d just need to pull out a game (or get a game from Pieces) and play it for a while. That seemed to work great. As playtesters tried out each prototype, they wrote down a 1-10 rating on a little card that would later become their ticket to the game giveaway. Design Day isn’t a competition, but the ratings are meant to help designers figure out how much work their games need. 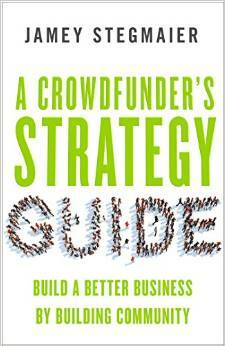 Have you found value in running or attending events related to your industry? If you want to attend Design Day next year, we’ll first give past attendees the chance to sign up, and we’ll announce any additional slots in our April e-newsletter. I just want to hop on here and say that Design Day is one of the most fun and useful days that I do. I have been to Design Day twice now and it feels great walking into a room and people walk up to you and just start talking as if a year had not just gone by. The knowledge that you learn is endless. Everyone is extremely friendly. I am more of an Introvert but being at this event for more than 10 minutes and you will start talking to everyone. Thank you Jamey for having this event. I look forward to it every year and you have helped me meet people in the gaming industry that I would have never had a chance to any other way. I had a blast! 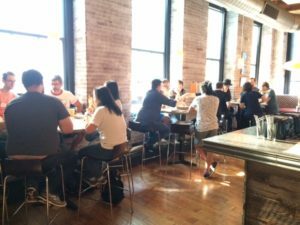 I just attended my first Unpub (prototype playing) event as a playtester in Chicago this month and found it to be a good time. Played a wide variety of games, got to see the game designer mindset at work and also provide some constructive feedback. Chris, I love playing prototypes! I should really go to one of those events. Do you design games too, or do you just enjoy playing them? I have played a number of prototypes from friends of mine but I haven’t ever attended an event like that. Glad to hear it is a lot of fun even for the folks who aren’t designers themselves. And, I don’t even mind when games are bad (usually) since that is part of the whole reason for doing playtesting… I enjoy being part of making it better. On the other hand I despise playing finished, published games that are bad. That just makes me feel like I have wasted time. :) Funny how much difference it makes really. What was your favorite game you played at that event? Or what kind of game was it? I was skeptical of the Unpub prototype event because I prefer to avoid games that are bad. I am not a designer, yet. Not sure I have the patience to test and research everything out. There was an exciting finish to a dice game called 8 Seconds about bull riding and another that I don’t recall the name of, but involved a world map and some interesting mash ups of mechanics that worked well together. 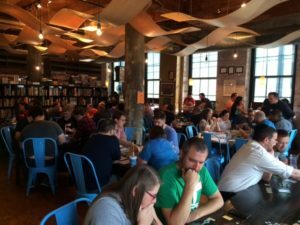 I highly encourage people to try out an Unpub event as a playtester. It was a 15 minute drive for me, but it was many hours for many of the designers and all of the designers appreciated everyone who played their games. I go to a lot of events (game days, meet ups, cons, etc.) in the area as part of the street team for a regional game convention so I know I can spread the word and the Gaming Hoopla and have the visit be a success.